Yet another windy day. Mick today asked where all the air is going to and when will we run out of it? We must have had all the air possible blow past us in the last week or so! Mick headed off to Boyes on a bike to buy some engine oil. The price in Boyes is good, but just a long way to transport it back to the boat. Luckily we have a sturdy pannier for the front of the Brompton which is big enough for 2 5L bottles. He also went to both marinas in the hunt for filters. The Beta rep had been yesterday trying to persuade them into stocking them, but nobody apparently asks for them! 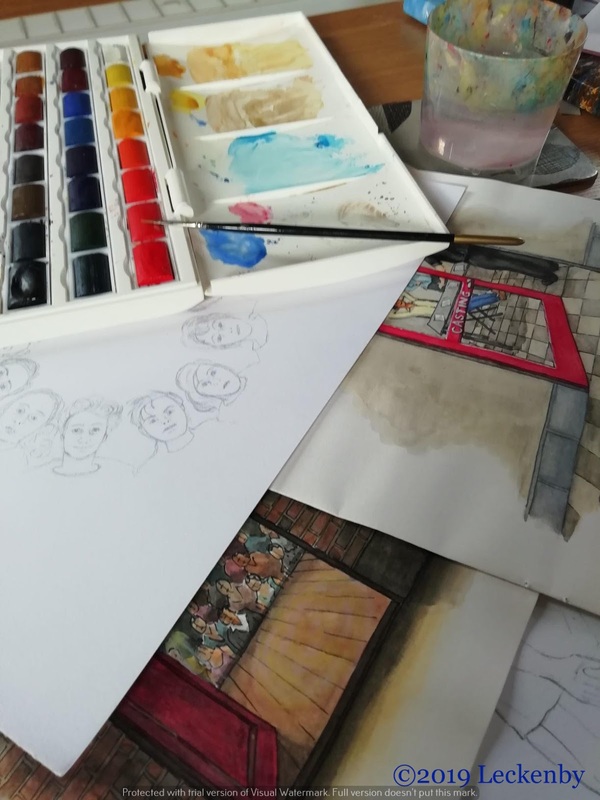 Some of the sketches I did after my trip to Huddersfield for the Separate Doors 3 project, have now been chosen for the report. Two will need extra work as they will be for the front and back covers. These will be in colour, so more work is needed on them. The boxes and sewing machine are too big for the hole! When I’d finished making my panto model last year everything had been packed away and stowed under the dinette in the corner. Since then we’ve been to Sheffield and had an extra support added to that end of the seating. 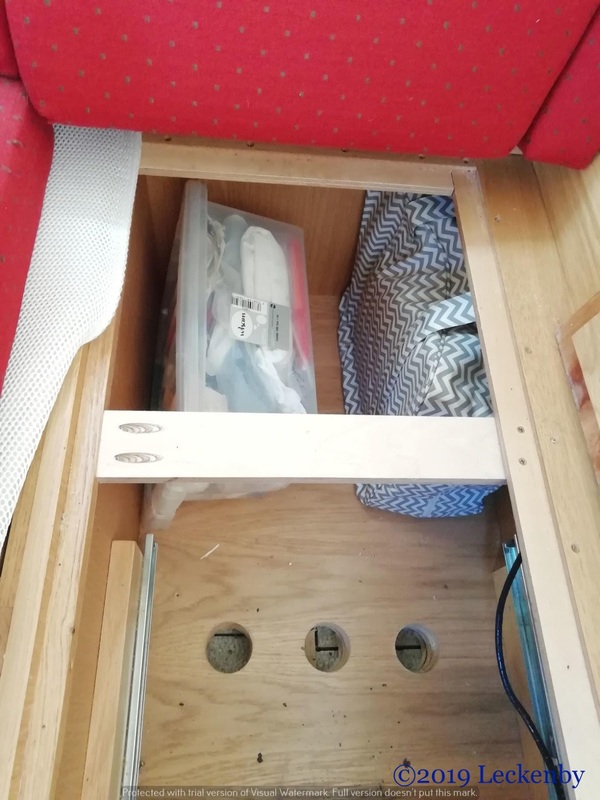 Kris positioned the support so that it wouldn’t foul the freezer, but it’s position means its in the way to get my work boxes out, the gap now being too small for the boxes to slide out through! I tried this way and that, in the end I had to pull the freezer right out on it’s drawer which gave me enough space to slide the boxes out. A bit of a phaff, but it’s only every now and then that I need my work things. As I sat down to see what else needed adding to my sketches Mick got on with various chores. Cleaning the u bend of the bathroom sink and removing the build up of my hair from the shower trap. He then removed the shower head and put it in some descaler for ten minutes. The difference is that you now stand in a torrent of water instead of it going in all directions but the one towards you. My sketches went away after a couple of hours. The front cover consists of 12 heads, mostly recognisable in pencil. I would normally now do an ink line, rub out the pencil and then use watercolours. But I’m worried I’ll end up loosing everyone. So I had a go without the ink, over the pencil on another drawing. I’m not convinced, so some more thought is needed before I launch myself at the front cover properly. The rivers are all still too high for us to escape, but we’re hoping that next week things will improve, the winds drop and we’ll be able to get moving again.
? MPH past moored boats! One person moved here today, a jet ski! It seems that canoes are not the only ones who can go as fast as they like on canals. I pitied those moored on the visitor moorings as he zigzagged his way and swooped to turn. Past us there are miles of water he could play on without any boats, but he had to play on our stretch. Luckily he was gone after half an hour. 0 locks, 0 miles, 1 Little Shuva on the river, 10 litres oil bought, 1 support, 2 hours, just 2 hours! 2 solar panels earning their keep, 6 sketches, 2 for colouring in, 1 very tentative brush, 1 improved shower, 2 draining sinks, 1 donation to rednose day. This entry was posted in Uncategorized on 17th Mar 2019 by pipandmick. The two bolts which hold the bracket onto the front frame on a Brompton aren't very strong. When I put a heavy weight into my front bag and went over a bump in the towpath the two bolts sheared off flush. I had to drill the bolts out which enlarged the hole and I had to re-tap it with the next size up.With hindsight I wished I had simply replaced the two bolts holding the bracket onto the bike with high tensile ones before loading the front bag. That would have been a much quicker and easier job. 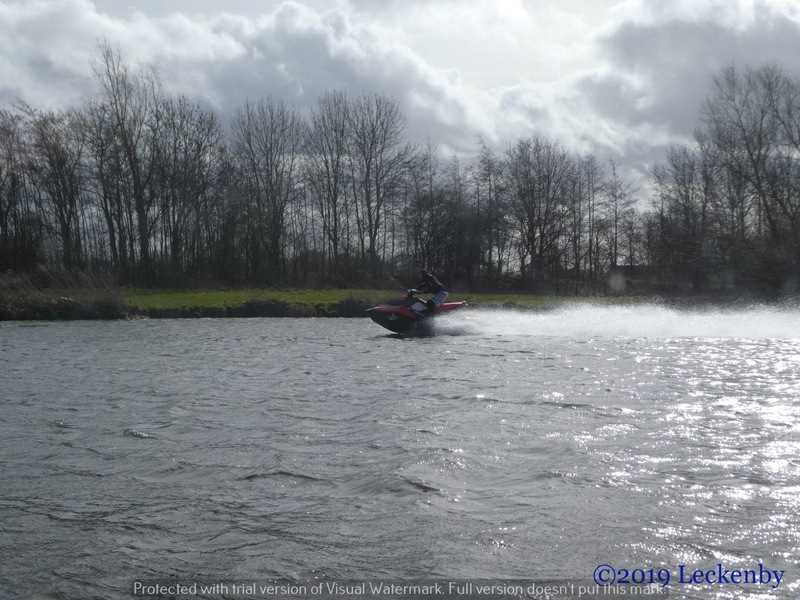 Great blog, particularly interested in your current journey as I've recently become a member just down the road from you at South Yorkshire Boat club.The Jet Ski may have been a bit of a promo for the Waterways Museum who posted the images on Facebook. Apparently they now do Jet Ski servicing which is an interesting side line! !I look forward to reading more about your travels.